The District’s Wastewater Treatment Plant is located at 100 Gothic Road. Miles and miles of sewer lines collect wastewater generated in the Mt. Crested Butte and Meridian Lake Park and deliver it to this location for treatment. Originally constructed in the 1963, the treatment plant has undergone seven expansions and / or upgrades to present. With these improvements, the District has been able to stay ahead of District growth and the increasingly strict state and federal regulations. Given a choice in 1996 of keeping chlorine disinfection or switching to Ultra Violet light, the District chose the latter. UV light destroys potentially harmful microorganisms, protecting downstream waters. The latest expansion project was completed in 2003, increasing the plant’s treatment capacity to 1.2 million gallons per day. The newest additions to the wastewater department are the “Smartcovers”. This sewer monitoring and alarm system is actually special manhole covers with ultrasonic sensors to alert the operators of any unusual manhole/sewer line activity. These sensors continuously measure water level to 1” accuracy, then direct and immediately communicate alarms to the responsible staff via wireless digital radio signals. 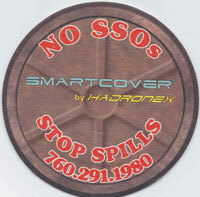 This system is designed to prevent sewer spills and lift station backups. Stops Spills. Manufactured by Hadronex, Because .. ..it happens. According to the Mt Crested Butte Water & Sanitation District Rules and Regulations adopted by the Board of Directors; sump pumps, drains or any illegal connection discharging into the sanitary sewer are not permitted under any circumstances. Violators may be liable to the District for penalties, plus any expense, loss or damage to the District system, including attorney fees. While servicing and inspecting other water or sanitation devices, etc, District personnel will be observing for the above mentioned connections. Please contact the District if you are aware or would like assistance in this matter.